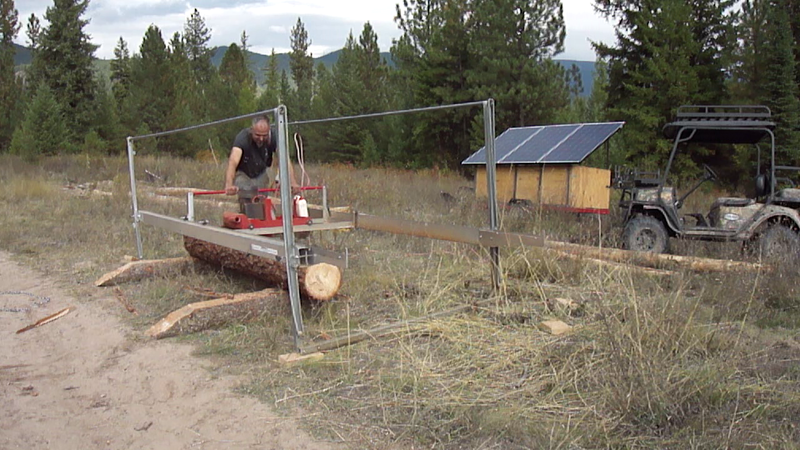 I'm looking at the pictures in the Solar Electric Sawmill and Solar Electric Chainsaw threads. In the background is a solar power cart. 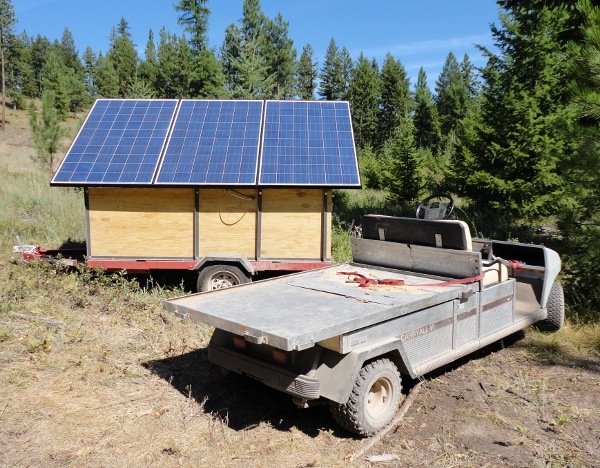 Looks like a utility trailer with solar panels on top, and a cabinet underneath which I can only imagine contains batteries, a charge controller, an inverter, maybe a breaker panel. I work on job sites all the time where portable power is required. Sometimes the plant shut down. Sometimes the work site is way off the beaten path. We'll rent a generator, put someone on staff to keep an eye on it, add fuel now and then. 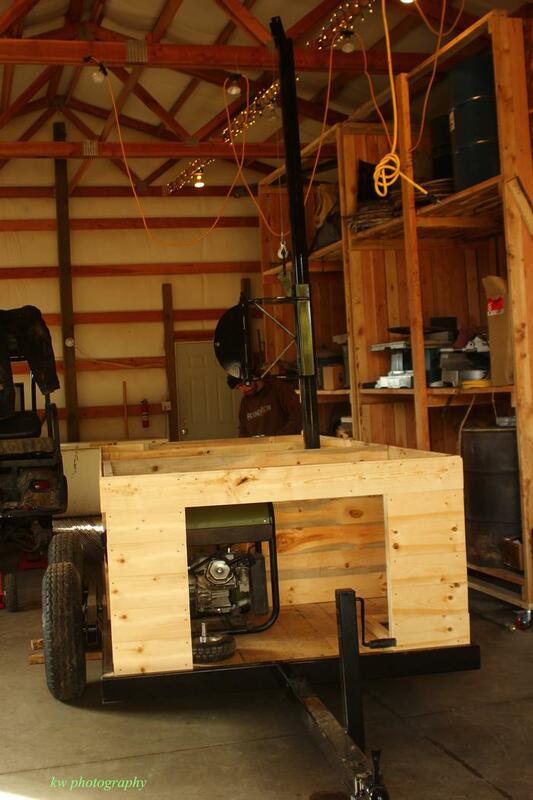 Something like this cart would be ideal for lighting, running pumps and power tools out in the field. Plenty of times it would be useful around the house. Power, when you want it, where you need it, no fuel to chase, no spills, no moving parts. Sure would be handy. I talked about building a mobile kitchen for keeping food warm for events, and this is an excellent solution for power. Can you describe it's construction in detail? I'm particularly interested in the cost of the rig, so 2 important questions: How much? and Give it to me. Were the components new or used? Where did you get the components? Any special construction to ease the rough road on the panels? How long would it run my fridge, a light, a laptop, an alarm clock and a well pump. Oh...and the coffee machine, a total load of 1500 watts per hour. Can the panels be folded down for longer transport. Does the rig need a grounding wire stuck into the world when operating? What sort of a wind load will this handle as designed? How fast do you haul it? How many batteries you got in there, or are you running the feed straight into the inverter? Can you plug in a golf cart to charge while hauling? What would be the range of such a plan? What does the rig weigh? Any specialized knowledge needed to build this? I cannot give details about their solar cart, but I can tell you what we have learn about solar carts. 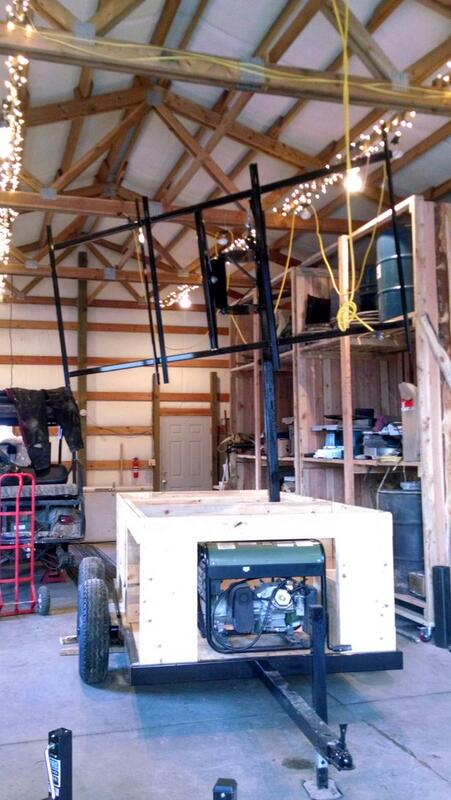 We have started a solar/mico hydro golf cart project. It is not finished, but all the parts have been purchased. In Oregon, in the summer we have lots of sun, little or no rain. In the winter we have lots of rain and little or no sun. 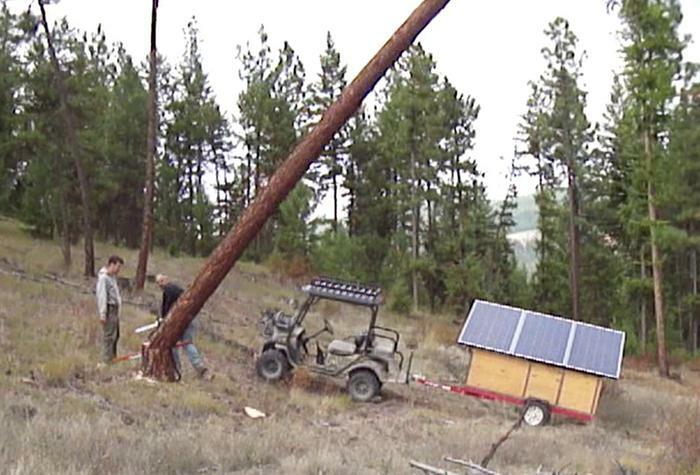 To charge the Solar Golf Cart we plan to use solar in the summer and mico hydro in the winter. We have a stream dammed up with a 35 foot head. We have not started on the mico hydro project yet. 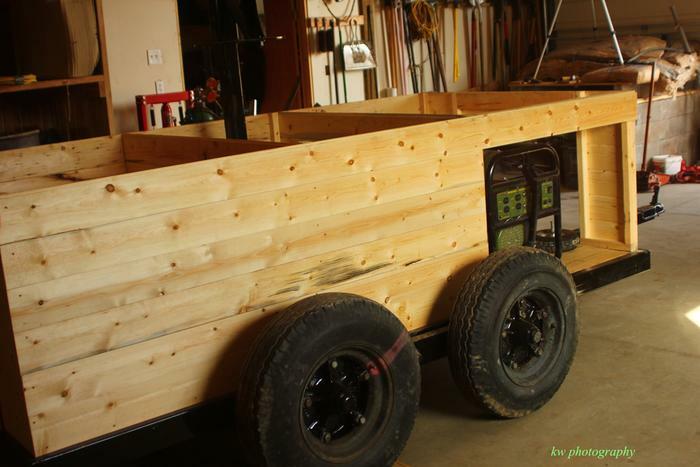 I will attempt to answer your question as they relate to our Solar Golf Cart project. We have contact the rep for turbo saw in Spokane, WA on the power requirements of the portable saw mill, but have not got back an answer. The first component we purchase was a E-Z-Go Industrial 881 Workhorse Cart electric golf cart. It has eight Trojan T-105 batteries. We feel that the T-105 6 volt golf-cart battery is an excellent choice since it is usually available locally. Its 62 pound weight and 7" x 11" base x 12" height. For system sizing purposes, this battery configuration eight batteries will store about 1 kWh of useful electrical power during a normal charge/discharge cycle. For example, if your system has eight of these batteries, you could power a 1,000 watt load for eight hours, or a 2,000 watt load for four hours, assuming the inverter and other electrical components are properly sized. If these batteries are not enough power we will replace them with Trojan L-16 size batteries. Eight of the L-16 size solar battery will store about 2 kWh of useful electrical power. They will provide a useful life in the 6-8-year range. This is three times the life expectancy of the smaller T-105 golf-cart battery. Unfortunately, the L-16 battery also costs three times the price of the T-105 golf-cart battery, and is only available from industrial battery-distribution centers. This means you may have a problem finding a local battery distributor that stocks this larger battery, which was originally designed for battery-powered floor scrubbers. Used Golf Cart = $2000. That included 8 used 6 volt Trojan t-105 batteries, which will cost $1200 to replace. We will secure them to the Golf Cart. Solar modules can be wired in series, parallel, or series-parallel arrangements to match the battery voltage you are using. Since we run a 48 volt system, we are wiring two 24 volt 250 watts panel in Series. Solar modules under 100 watts in size usually have a 17 volt DC output under load, but are still referred to as "12 volt" modules. This is because the voltage output of any solar module must be higher than the voltage of the battery it is trying to charge or no charging current will flow. Solar modules over 100 watts in size have a 34 volt DC output under load, but are referred to as a "24 volt" module for the same reason. Our golf cart will have a solar array uses one pairs of 24 volt modules wired in series to produce a 48 volts output. We have purchased used Grape four (4) 250 watt panels at $650. They sell new at HomeDepot for $375/each and three (3) Grape 280 watt panels at $800. They sell new at HomeDepot for $395/each. How many will be used will depend on the load we place on them. 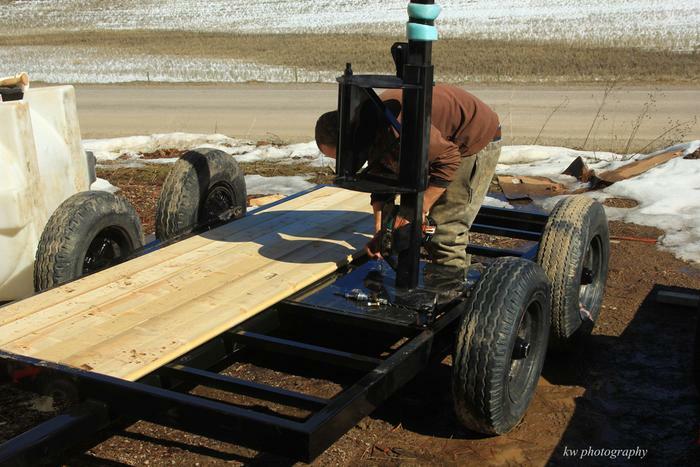 The panels will be attached to the side of the Golf Cart and hinged so they can get the best angle of the sun, depending on the month of the year. When they are not in full charging mode, they will be folded down and secured and the cart can be driven. The amp-hour of the Trojan T-105 batteries is 105 amp-hour. Since the output of the batteries will be going through a 3600 watt Outback inverter it will be 110 volts at 30 amps. You could run them about 3 hours if they are all turn on. Can the panels be folded down for longer transport? Yes that is what we plan. The Golf Cart will be charging with the panels down in their locked position, but not a much as fully extended. 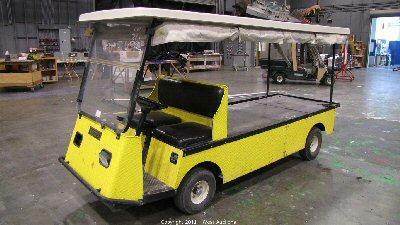 The plan is to use the Solar Golf Cart to have portable power and power the lighting circuits of a building. The rest of the building with the big energy uses such as coffee maker, electric water heater, clothes dryer, microware will be on the Grid. Golf Cart Weight with batteries: 1,744 lbs. Regardless of your solar array and battery bank size, you will need a solar charge controller. The charge controller's job is to control the battery charging process, and protect the battery from damage due to over-charging. This device has input terminals for the solar array and output terminals for the battery bank. More expensive charge controllers adjust the charging rate based on battery temperature, and can be programmed for a battery voltage that is different from the solar array voltage, but most solar modules are wired to match the battery voltage. We will using a maximum power-point tracking (MPPT) charge-controller. These more expensive charge-controllers constantly adjust the charging voltage and current to maximize battery charging. This puts more solar charge into the batteries than a lower-cost non-MPPT solar charge-controller. If you are working with a limited budget, you can start with the smaller golf-cart batteries and switch to the larger batteries after these reach the end of their useful life. You should also design your solar-array mounting system to support more solar modules than you start out with, since a solar array is easy to expand later if the support frame is properly designed. A smaller low-cost solar charge controller can also be up-sized later if you add more solar modules in the future. However, I would not skimp on the inverter. Decide what you want the total system capacity to be and purchase the right inverter to begin with, as it will be very costly to replace an undersized inverter later. Remember, the inverter is the heart and brains of the system, and you will want an inverter model and brand that will provide a stable AC output voltage under all load conditions. Higher quality inverters will also include a digital display that can show system performance, error messages, and other useful system information. Unless your system will be very small, it is doubtful you will find a 12 volt DC inverter with the capacity to power more than 1,000 watts of electrical load, regardless of battery size. 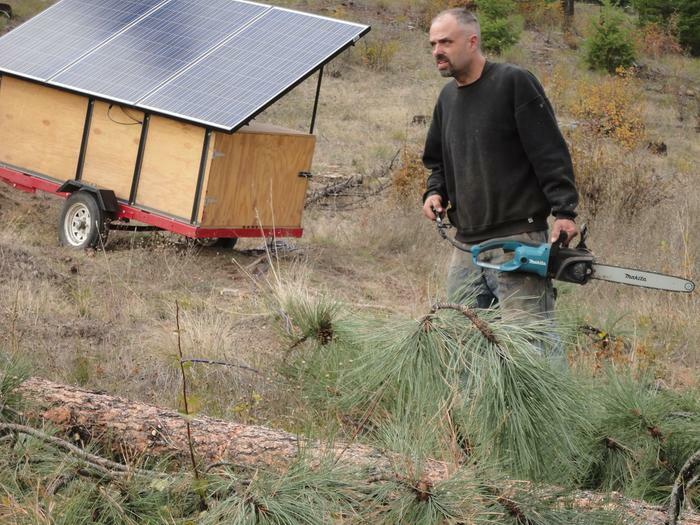 You should have an inverter with a 2 kW or higher load capacity, so your solar power trailer will be using either a 24 or 48 volt DC inverter. Most 24 volt inverters will have a 120 volt AC output capacity in the 2-3 kW range, which will easily power a well pump, microwave oven, small power tools, and most lights and kitchen appliances. We selected a 48 volt 3600 watt DC OutBack inverter. Inverters for 48 volt battery systems will have output capacities in the higher 3.5-5.5 kW range. In addition, regardless of the electrical loads being supplied, a 48 volt inverter will draw exactly half the current from the batteries that a 24 volt inverter draws. This means you will be able to utilize smaller battery-to-inverter cables when using a higher voltage 48 volt DC battery bank. Inverters are available in "modified sinewave" and "pure sinewave" versions. A modified sinewave inverter produces 120-volt AC power using a voltage waveform that increases and decreases in several small steps to simulate the utility grid's smoother sinewave-shaped voltage profile. If the waveform output of the inverter is not exactly 60 cycles-per-second, clocks will speed up or slow down, and sensitive electronic appliances can be damaged. However, power tools, lights, and most computers will usually operate without any problems on a modified sinewave inverter. Photocopiers, fax machines, and light dimmers usually have serious problems when connected to a modified sinewave inverter, so be careful what loads you supply. A pure sinewave inverter costs significantly more than a modified sinewave inverter with the same capacity, but you will be able to operate almost any 120 VAC device on this inverter. The power output from a pure sinewave inverter is actually cleaner and more stable than the power supplied by most utility grids. I hope this information help. Makes it hard for me to even consider buying a gas generator. If the batteries have been drained from a hard nights work, how long, in your location with a sunny day, to recharge the batteries? If you have four 250 watts panels with a MPPT controller and eight T-105 batteries and they are to 30% of their capacity on a full sunny day and the panels set of the optimum angle to get the most sun, it should take 5-6 hours. Since we have not finished our project that is a calculation, not experience. and just a couple more! This touches quite a bit on a project that I have started, and come to a stand-still. Bought a mobile food kitchen caravan, and because generator power is such an expensive and noisy option, we thought we would power it with solar battery and bought 12 x 2v x 800amp dry-cell batteries second hand. They weigh about 650kg total, and are 50cm high and take about 1/2 metre square area. Before buying, we were told that the caravan could easily hold and pull this weight - much less than a horse float with two horses, which my sister-in-law pulls round all the time. They also measured to fit nicely under the bench at the tail end of the caravan. We thought we would put them in the food caravan, have solar have the caravan parked by the house when not at the week-end markets, so that the solar panels on the house can charge the batteries, and the house can use the batteries at night. They are currently set up in parrallel 12V, so we could also divide them to two sets of 12V, and have half at the house and half at the food kitchen. After we bought them, some of the "experts" are saying that it is not a safe weight to have sloshing round the caravan when moving, and that being round the batteries themselves is not safe and could put out fumes, or emf etc, and that we should spend a few thousand dollars to build a concrete bunker near the house and put them in that, and just use them for the house. Other people have said that it should not be a problem. The darling 11 month old baby who was just starting to crawl and would sit for hours in his chair when we bought the food kitchen is now a 20 month old toddler who can disappear in an instant, and we realise that the markets are not a doable option as long as my husband does a rotating roster. We currently just park it next to our house and use it as a commercial kitchen to cook baked and jarred goods to sell on consignment to tourist stores. Longer-term, we would like to set up a "pick your own organic veggies and small scale shop/restaurant on our property, but we would still like the ability to take the food kitchen out on promotion to markets if possible, and have an instant power source. Can anyone comment on the whole safety issue of batteries in terms of either 650kg or half of that weight (if we use divided them in two) in the back of a caravan going 100km down the highway. About the safely of standing for a several hours right next to a bank of batteries, and also of the risk of dry-cell batteries exploding. Another option would be to make some sort of cart like this that we winched into the back of the van and parked several meters from the food caravan when we were using it. it would only need to be big enough to hold the batteries, not the solar panels. At peak load with everything on at once (pie warmer, pizza oven, 4 soup warmers and full-size fridge-freezer, electric hot water, coffee machine, and griddle) the food cart would use about 6kW. But we may not ever use all of that. Please provide more info on the batteries. You mentioned 2 volt "dry" cells rated at 800 Amp-hours -- are these sealed batteries (either AGM or VRLA)? If you can supply the brand name, or post a photo of the label on a battery, that would help a lot. 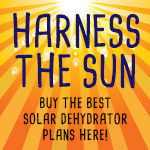 I own a solar design and install company, and would be glad to help if I can; seems like a few others here have accumulated a lot of know-how, too. Flooded batteries might not be much fun to slosh around, but there are a number of job site trailers like the one pictured that use 4 or 8 L-16 batteries, and as long as they are secured against tipping over, and vented so the fumes can escape, the dangers are very low indeed. There are some batteries that could be a potential hazard, but your description (so far) doesn't scare me at all. The AGM batteries that I have used won't even leak if you smash through the side wall with a golf club, so I suspect the local "experts" you mentioned are the typical know-everything busybodies, with no real experience from which to speak -- the "nattering nabobs of negativism", wasn't it? this is the ad about the batteries, and is about all I can say. they are in storage on a pallet away from the house at present. Perhaps a picture or two would be helpful. Especially a close-up of a label, so people might be able follow back to the manufacturer - who may have most of the info you want. My first thought, though, is "what were these used for?" and "what do other people use these for?". If you can find people using these every day, that goes a long way toward telling you what they might be good for, how to treat them, etc. It sounds like they are common lead-acid batteries. 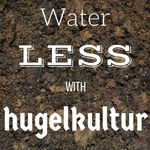 but the sealed type that doesn't allow any water to be added. As I understand it (I read up a lot but I"m not professional...) that means that they need to be charged properly (fully but not too much) or they're life will be greatly reduced. To find out the charging specs you need to know the manufacturer (so you can find their specs). I'm not sure how you can tell when they are fully charged w/out any way to test specific gravity of their fluid. Generically a battery is fully charged when it stops "accepting" more charge. But to determine that when it stops accepting charge (and starts boiling) w/out being able to access the fluid you need to measure and graph the charge voltage and current so you can see when they stop changing... IOW, it's a PITA w/out specialized equipment so that's why the manufacturer's specs and instructions are really important. Maybe the quickest way would be to go back and ask lots of questions of the person you bought them off of. It would be nice if he's used this exact type of battery for years and could tell you how to deal with them. 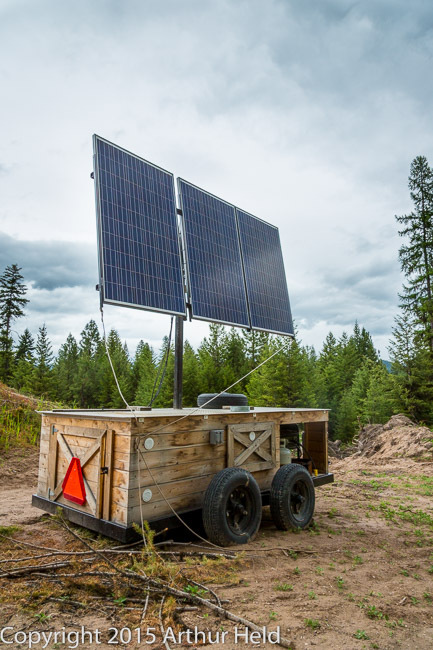 Big heavy-duty 2-Volt cells are common for serious off-grid solar applications. Usually the big 2 volt fellas are flooded, and require more maintenance; "sealed" would usually refer to AGM, or Absorbed Glass Matt batteries, which would be fine for your application. The major difference between flooded cells and AGM's is that flooded cells store more usable energy, but require more maintenance. Heavy duty flooded cells can handle an occasional discharge of up to 80% (meaning 80% depth of discharge ,or DOD), but the discharge should be limited to about 50% if possible for longer battery life, and if you can routinely limit the discharge to 25 - 30%, all the better -- the batteries will last longer. AGM batteries can only handle a maximum discharge of 50%, and routine discharge should be limited to 25% - 30% whenever you can. In other words, true heavy-duty flooded cells can occasionally deliver up to 80% of the power stored, while AGM's can only deliver 50% at most. Loads and Capacity: 24 Volts at 800 Amp-hours = 19,200 Watt-hours at 100% discharge, so for sealed (AGM) batteries, you'd only be able to use the top 50% of that, or roughly 9,600 watt-hours. That equates to a 100 watt item running for 96 hours. BUT, routinely draining these batteries to a 50% DOD (depth of discharge) will shorten their useful life considerably. 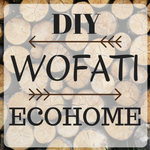 If you can limit your usual and customary discharges to around 30%, they will last longer (but you'll only have 5760 watt-hours to use to stay within that limit, or 57 hours per 100 watt load). Charging the Batteries: Charging these is no big deal at all with the proper equipment, but the good stuff ain't cheap. Assuming you will use an inverter to produce AC power from the DC power stored in the batteries (NOT 100% efficient, BTW -- expect additional losses of around 10%), what you really want is an inverter/charger. Stick with a name brand like Magnum (shown at Paul's place, above), Outback, or Xantrex (now Schneider). These have a built-in ac charger and internal transfer switch, so when connected to AC current by plugging in at home, or from a generator, they will charge the batteries. For Magnum equipment (my preferred brand), you'll need the Remote (RC-50), and the battery monitoring kit (BMK). Instead of screwing the unit to a wall, it's best to get the MMP, or Mini-Magnum Panel, which has all the AC and DC switch gear, as well as a calibrated shunt so the battery monitor can take accurate readings of power in and power out. The RC-50 is the black display shown in the photos above showing the voltage and amps being used. The top-shelf equipment mentioned can be set up for different battery types, and you tell it how many Amp-hours of battery bank, and let them do their thing. 24 volt batteries are typically bulk charged to 28.8 volts, then held there (Absorb, or "Acceptance") for 2-4 hours, and then reach the Float stage , where they are held at a slightly lower voltage to keep them ready to go. For 800 Amp-hours the absorb is probably 3 hours to start, and longer as the batteries age. Sealed batteries should be fully charged at least once per week, and NEVER equalized. (Flooded cells are typically equalized monthly during periods of heavier use). Batteries are not considered fully charged until they have gone through the Bulk and the complete Absorb charge cycles. In other words, if you are using a generator, don't stop charging when you reach the target of 28.8 volts -- you need to keep them there for at least 2 hours, and longer for larger battery banks, probably 3-4 hours for yours. If you are trying to be a good citizen and want to avoid burning fossil fuels, generating smoke and noise and all that (or just saving $$$), you will be sorely tempted to turn off the gen-set when you reach 28.8 volts, but you will be killing the batteries if you do it. Either use a "cleaner" source of power (ha-- often a trap! ), by plugging into grid power (a.k.a. "shore power"), or realize that you are making a trade off between your very real and sensible environmental concerns, and destroying batteries by causing them to die prematurely. Since batteries are made of pretty toxic stuff, and the recycling of these components is often handled by barefoot 12-year-olds in Mexico, you probably don't want to ruin those batteries, either. Thus, the dilemma. Solar Charging: If charging with solar panels get a first rate charge controller from Midnite Solar ($$$), Outback ($$), or Morningstar ($$). I typically use the Outback FlexMax-60 for smaller systems. Not cheap, but until the Midnite Classic came out, the best of the best. The charge controller shown above with the cover removed is a Morningstar TriStar MPPT, and appears to be the 45-amp model. TriStar MPPT controllers are very efficient, but they don't have an auxiliary output to run a vent fan, which is essential with flooded batteries in a confined space (though not needed for AGM). Since I don't like having to add an expensive voltage-controlled switch, I use Outback, which has the fan control circuit built in. You still want those batteries FULLY charged at least once per week, so if you need to use them daily, you'll probably want to plug the inverter/charger in to grid power whenever there is not enough sunlight to recharge them fully. OK -- this is getting pretty long, and a little too close to a textbook, but I hope it helps. Don't leave your batteries in storage for a period of years -- make sure they get a charge every few months to keep them from aging while doing nothing -- like staying in shape with a little gentle exercise. Good luck, and best wishes getting your power cart set up. Just Spit balling here, feel free to pick the whole thing apart ! There are very small camper bodies that fit onto the back of the Ubiquitous Ford ranger Chevy S-10, they usually come with a set of four folding legs, one to a corner! solar Panels Battery Pack, allowing the two units to be easily separated and serve at different sites or together with changes made daily as the situation required. Maintenance on the battery Pack would be much easier with the increased exposure that the ability to separate the two components would add to the whole platform ! 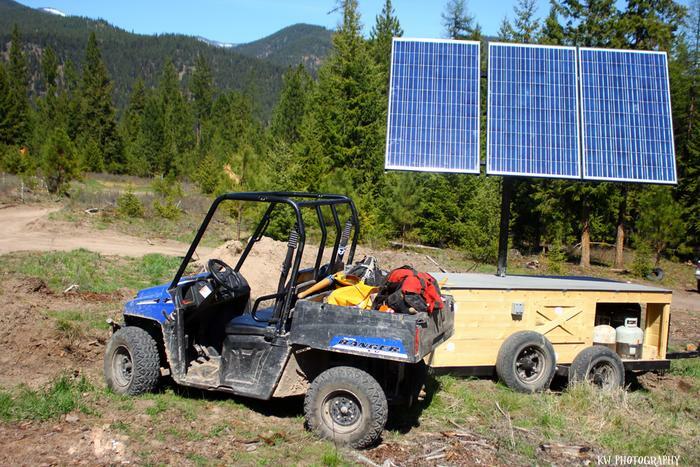 The upgraded solar power cart. Note the new trailer which Tim built from scratch. This has a "walking suspension" which is, apparently, far superior for off road use. In this pic you can see the mast that the solar panels will be mounted to. You can see where the propane generator will be housed "just in case". You can also sorta make out how the two wheels are mounted to a bar that has it's own pivot point between the two wheels. Love the industrial strength trailer! Man, Tim does good work. I made a little Solar powered 12v utility cart for smaller homestead use. I did have the panel mounted to it, but found that my battery bank is large enough and my loads small enough I don't need to truck the panel around with me. My largest load (either water pump or intermittent inverter use) will go pretty much all day without dragging the batteries down too far. I have a second slightly larger bank at the panel's location, which runs interior lighting in my home, and that bank can bring the cart bank up quickly if needed. I love this little set up, particularly the pump. It's so nice to be able to have pressurized water at any location from any source. Hope you don't mind me adding this on to your thread Paul, I thought it would be cool to show folks a smaller version of a similar concept for smaller homesteads where there aren't a whole crew of folks working all the time. Matt Walker wrote: Love the industrial strength trailer! Man, Tim does good work. I made a little Solar powered 12v utility cart for smaller homestead use. I did have the panel mounted to it, but found that my battery bank is large enough and my loads small enough I don't need to truck the panel around with me. My largest load (either water pump or intermittent inverter use) will go pretty much all day without dragging the batteries down too far. I have a second slightly larger bank at the panel's location, which runs interior lighting in my home, and that bank can bring the cart bank up quickly if needed. I love this little set up, particularly the pump. It's so nice to be able to have pressurized water at any location from any source. Hope you don't mind me adding this on to your thread Paul, I thought it would be cool to show folks a smaller version of a similar concept for smaller homesteads where there aren't a whole crew of folks working all the time. Matt, love the utility cart. Is the water pump an on demand (meaning will shut off when pressure is reached) or continuous run? 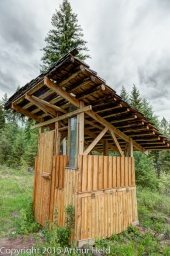 I have plans for something similar but will include 1 or 2 solar panels for use at my hunting cabin where I have no power at this time. Thanks Ryan. This is what's known as a "washdown pump" in the marine world. It does have an internal pressure switch so will shut off when it reaches it's set pressure. I'm not sure what that is, but it is more than adequate for my needs, I'd guess in the 40psi range. There are both "washdown" and "water pressure" pumps available in 12v marine stores. Both have the internal pressure switch, "washdown" pumps are made for raw water (seawater) and will handle some particulate and stuff and typically come with an inline filter, the "pressure" pumps are typically for clean/fresh water only. Both are available in a variety of GPM sizes. Mine is around 5 GPM, and ran around $100 IIRC. 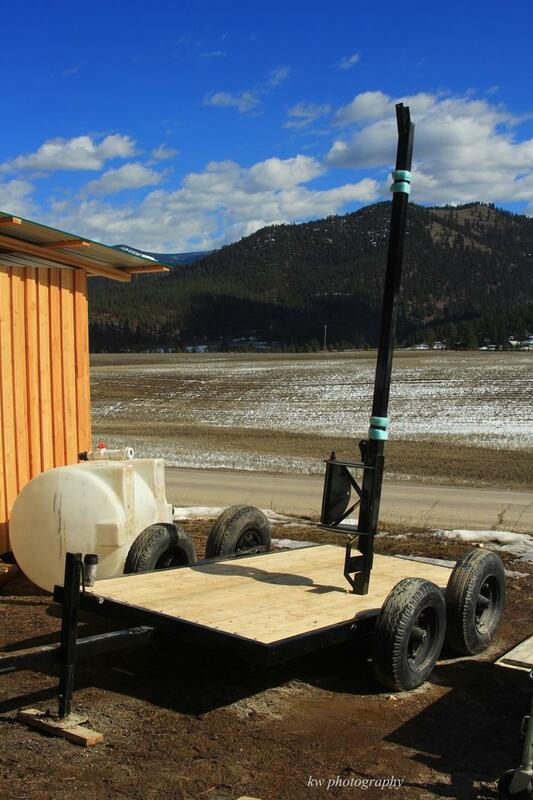 The solar cart now has its completed trailer upgrade. In this picture you can see the new mast in all it's glory. Plus you can see the "walking suspension" dealing with a non-flat off-road surface. Paul talks a ton about the volstwagon in his new podcast. Thought you all might be interested. I may need to ask this as a new question as well, but are hoping this catch those that gave me great advise last year. We are in the situation where my husband has lost his job, so now have the time, but not the money, to go to the markets with our food trailer, and to use the batteries. As we mentioned above, we have 12 X 800amp 2v sealed deep-cycle batteries, which are about 50kg each. We bought them to go into a food trailer, but have had local "experts" keep trying to convince us what a bad idea this is, and that we need to keep them at home as part of a home solar power system. Previous advise was that it would be dangerous in terms of fumes, and explosion risk, and to put them behind concrete. Now we are also told that he thinks that regularly moving deep cycles batteries is bad for them and would shorten their life. Is there any truth in this? I mean they run golf carts etc all the time. We would be taking them slowly 2-3km (1.5 miles) to the local market down a flat country road, and then home again. We are currently thinking of leaving 6 at home, and taking 6 with us (so 300kg each). We could have them fitted into the food caravan, or we could put them in the back of our van for now (this vehicle is used almost solely for towing the food trailer) and have a little trailer made when we can afford it, and tow them separately (we could use our little 800cc Suzkuki Alto for this probably) and we could then also pull them round the farm on a quad bike or ride-on when we can afford one. They have also been sitting uncharged for over a year in storage, but we are getting them delivered here this week. (they have been used before we got them). How much damage could this have done? Is it best to recharge them ASAP? They are currently sit up in parrallel to make 12V. Could we put a normal 12V car charger on them and (VERY) slowly charge them from normal grid power? Could we also then just put a 2000W inverter that we have on them and use them that way till we can afford . (When we can afford it, we will get a larger charger/inverter and solar panels etc that live at home, and charge both sets of batteries). Nice picture of the ol voltswagon. Can someone point me to the discussion about the voltswagon and it's wattage? I've done search but haven't found anything. Thank you. Also, I'd love to hear opinion from the inhabitants of the lab as to the efficiency, usage and limits of the solar devices employed at the lab? Thanks. I don't know precisely, but from what I understand, the solar leviathan uses 250 watt panels and these appear to be similar in size. They certainly look slightly taller and much wider than my 145 watt panel. Larger panels like these are often higher voltage than the nominal 12V seen in smaller panels. A high end MPPT charge controller should be able to use higher voltage panels on lower voltage batteries. This would require research into particular charge controllers, panels, and battery systems to make certain they are compatible. For a mobile system, getting monocrystalline panels and a quality MPPT charge controller are a good investment because it will give you a superior power to weight ratio than other commonly available products. Monocrystalline panels will take up less area for a given wattage than polycrystalline, amorphous, or any of the thin film panels I have seen so far. The size and weight savings is why they are used in aerospace. It would be a good idea to look up different wattage panels and take note of the dimensions to get an idea of how big panels are in given wattage ranges. The panels pictured appear to be polycrystalline and probably over 5 feet tall and around 3 feet wide each. I think that how to make a solar voltswagon is a worthy topic for a kickstarter DVD or a book. Heck, even just a download would probably be worth buying. Julia Winter wrote: I think that how to make a solar voltswagon is a worthy topic for a kickstarter DVD or a book. Heck, even just a download would probably be worth buying. Jason was looking into doing this. I set him up with all the raw footage last summer. I get the impression that this project isn't all that exciting to him. Hmmm, perhaps there is some other person who is interested in developing this project?